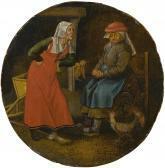 Find artworks, auction results, sale prices and pictures of Pieter Ii Brueghel at auctions worldwide. 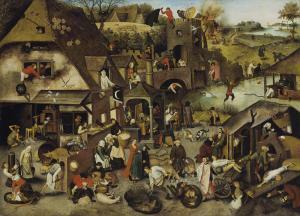 Pieter Brueghel, the Younger (Brussels 1564/5-1637/8 Antwerp) The Netherlandish Proverbs oil on canvas 47 ¾ x 65 5/8 in. (121.3 x 166.7 cm.) Provenance Jonkheer Adriaan Johan Hugo Repelaer van Spijkenisse (1845-1884), Brussels, and by inheritance to his brother, Jonkheer Johan Adriaan Paulus Repelaer van Spijkenisse (d. 1913), Haarlem, and by descent to, Jonkheer O.S. 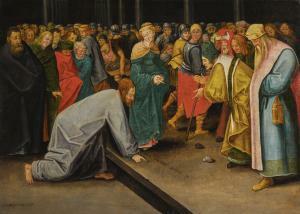 Repelaer van Spijkenisse; Christie\’s, Amsterdam, 6 May 1993, lot 99, as 'Attributed to Pieter Brueghel II'. with Johnny van Haeften, London, 1994, as 'Pieter Brueghel II', from whom acquired by the present owner. 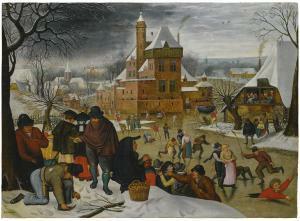 WINTER LANDSCAPE WITH SKATERS Pieter Brueghel the Younger BRUSSELS 1564 - 1637/8 ANTWERP signed lower left: P BREVGHEL oil on oak panel 40.9 x 56.5 cm. ; 16 1/8 x 22 1/4 in. Provenance Anonymous sale, Paris, Galerie Charpentier, 16 June 1960, lot 32; With Galerie Robert Finck, Brussels, 1960 (when advertised in Weltkunst, 15 November 1960); Jacques Grazia-Empain, Brussels, by 1969; With Galerie Robert Finck, Brussels, by 1985 (and advertised in Weltkunst, 15 September 1987); From whom acquired by the grandfather of the present owner. 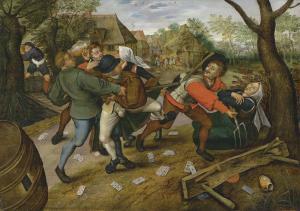 Pieter Brueghel II (Brussels 1564/5-1637/8 Antwerp) Peasants brawling signed and dated 'P.BREUGHEL. 1619' (lower left) oil on panel 28 ¾ x 40 ½ in. (73 x 103 cm.) Provenance Count Cornet de Ways-Ruart de Vanêche, Brussels. Etienne Le Roy, Brussels, 1871. The Metropolitan Museum of Art, New York (inv. no. 7125), by 1931, deaccessioned; Sotheby's, New York, 19 January 1984, lot 130. with Colnaghi, London, 1985. Anonymous sale; Sotheby's, London, 10 December 1986, lot 55, when acquired by the following, Anonymous sale; Christie's, New York, 29 January 1999, lot 76, when acquired by the present owner. OLD MASTERS FROM THE VAN DEDEM COLLECTION Pieter Brueghel the Younger Pieter Brueghel the Younger BRUSSELS 1564 - 1637/8 ANTWERP signed and dated lower left: ·P·BREVGHEL·1628· oil on oak panel,the reverse branded with the clover leaf mark of the panel maker Michiel Claessens (active in Antwerpcirca1590–1637) 26.8 x 37.7 cm. ; 10 1/2 x 14 7/8 in.